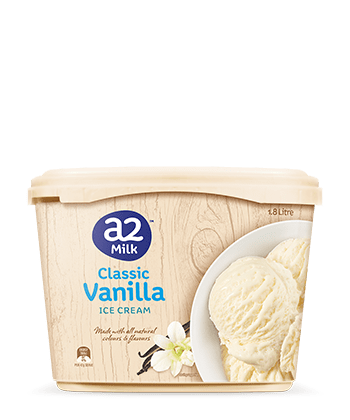 Enjoy the only ice cream that is made from pure, natural a2 Milk™ and cream (from a2 Milk™) . Our cows produce a great tasting fresh milk that is naturally rich in A2 protein – You’ll love the difference. Reconstituted a2 Milk™ [Skim (52%)], Cream [From a2 Milk™ (27%)], Glucose Syrup (Wheat), Sugar, Maltodextrin, Vegetable Origin Emulsifier [471 (Soy)], Vegetable Gums (412, 410, 407a), Natural Flavour, Natural Colour (160a). Made on equipment that also processes products containing Peanut and Tree Nuts. Ice cream contains 10% milk fat. Claims: Made from pure, natural a2 milk and cream. Can we please get this is USA???? There is a huge amount of people who cannot tolerate regular dairy which makes this product appealing. The problem is most people who can’t tolerate dairy also can’t tolerate gluten. Your ice cream contains gluten. If you can figure out how to make a version that is also gluten free with no sugar added, I would buy it along with millions of others with serious digestive problems. It could be marketed to health food stores like Earthfare it Trader Joe’s.